Alongside delicious food, the drink you serve at your wedding also needs serious thought. Deciding on how much to provide for your guests, what to serve when and how to ensure your decisions compliment your day and food can be a minefield, so Coombe Trenchard wanted to try to make this easier for our bridal couples with a handy blog post. Our alcohol policy aims to provide both flexibility and budget friendliness for our bridal couples, alongside compliance with our insurance and thoughts of safety for guests and the house alike. Our preferred bar company, Thirst Choice, can provide a very purse-friendly whole day drinks package that can be a hugely beneficial option, especially due to their creativity and flexibility. Alternatively, bridal couples are permitted to provide their own alcohol for the drinks reception, toasts and wedding breakfast. Whilst able to source and supply this themselves, we highly recommend using Jaded Palates for this due to our wonderful relationship with them and appreciation of their passion and delicious drinks! Jaded Palates will enhance your wedding planning excitement with their contagious joy and enjoyably educational tasting experiences. Providing alcohol at wholesale price on a sale or return basis ensures value for money and stress-free buying. Alongside wines chosen to compliment your menu, you will make treasured memories, receive personal service and benefit from chilled wines being delivered with ease for your Big Day. Drinks receptions tend to comprise of seasonal treats like Pimms or spiced cider in addition to or instead of some fizz. Depending on your guests, you may also wish to provide some ales or lager alongside this and, of course, think of a soft drink addition (we find Elderflower cordial and sparkling water go down well!). Jugs of water are also important, especially in fair weather. 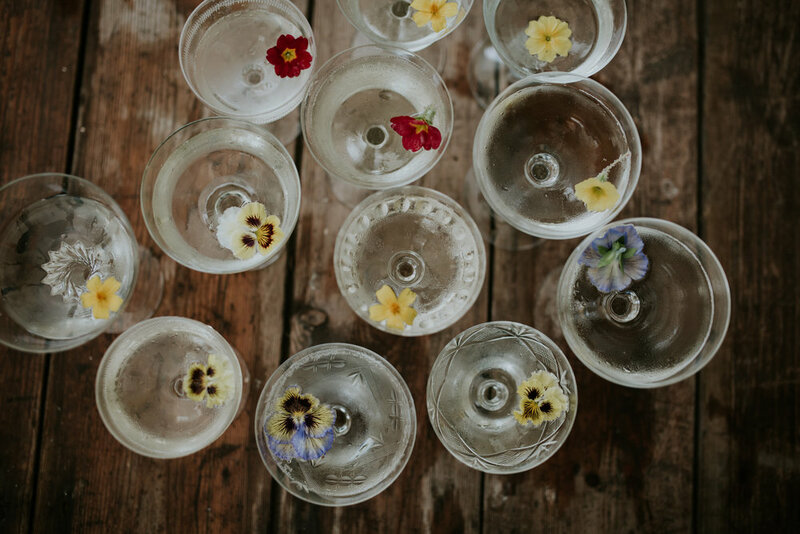 This element of your day will need to be manned – either by a bar company, your caterers or Coombe Trenchard to ensure a safe, clean and well-executed drinks reception. Glassware may be provided by the bar company, caterers or this can be hired in (some supermarkets offer this as a free service). For your wedding breakfast, you will want to choose wines (or alternatives!) to compliment your menu’s flavours and style. Jaded Palates can help you do this or you are welcome to decide and provide this yourselves or in partnership with your caterers. Your caterers may be able to help you chill and store your wine and provide glassware for you, but this will need to be discussed with them. Most wine is simply added to the tables, but do discuss serving with your chosen caterer also. During your speeches you may wish to provide something special to toast your wedding! This would normally be prosecco or champagne and will need to be chilled. Flutes would be needed to serve, although you could also use Coombe Trenchard’s vintage collection of champagne saucers (if within the house). Serving will need to be discussed and would normally be undertaken by your caterer if happening after/during your wedding breakfast. If you are wanting to look at alternative options for speeches, we are happy to discuss your own unique plans with you. In the evening, your bar will need to be manned by a personal license holder in line with our insurance. This would normally be Thirst Choice and could be a free bar or cash bar, depending on your budget. Thirst Choice will work with you to stock the alcohol that you would like them to serve and love to come along to Coombe Trenchard for tasting sessions with you! They will be responsible for your evening party and ensure the safe serving of alcohol. Once Thirst Choice’s bar opens all other alcohol will need to be put away, something your caterers will be aware of. Jaded Palates sale or return policy would be hugely beneficial here and ensures you are only paying for the alcohol you use, and not worrying about running out! Drinks can be done as simply or as lavishly as you would like (much like weddings!) and we are happy to discuss your requirements and thoughts in much more detail over a cup of tea. Do call or email us to pop you in the diary and ensure a relaxed wedding planning experience at Coombe Trenchard. You can find out more from our General Information sheet sent at booking (or available upon email request) and by visiting Thirst Choice and Jaded Palates websites.